Twenty years ago, President Clinton commenced bombing Serbia for no good reason. Up to 1500 Serb civilians were killed by NATO bombing in one of the biggest BS morality plays of the modern era. Clinton sold the bombing as a humanitarian mission, but the resulting carnage resulted in the takeover of Kosovo by a vicious clique that was later condemned for murdering Serbs and selling their kidneys, livers, and other body parts. 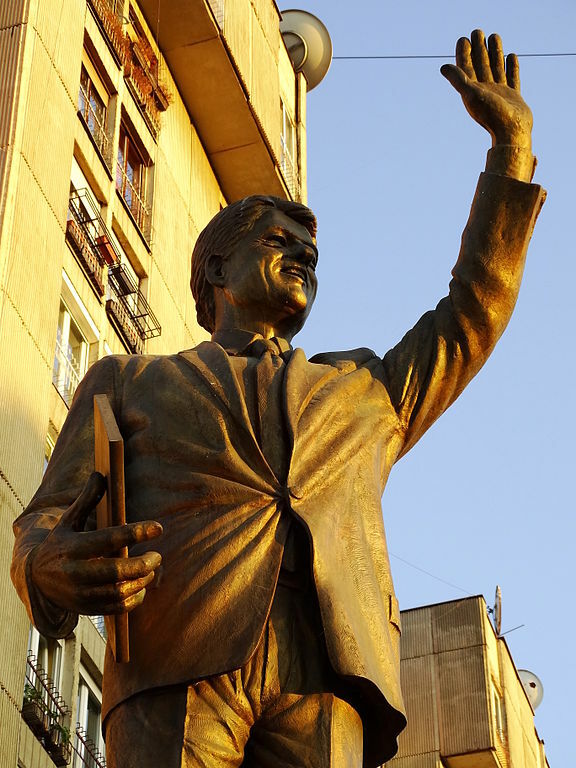 But Clinton remains a hero in Kosovo; here is a statue of him erected in the capitol, Pristina. It would have been a more accurate representation if Clinton was shown standing on the corpses of the women, children, and others killed in the U.S. bombing campaign. April 7, 1999 Much of the media and most of the American public are evaluating Clinton’s Serbian policy based on the pictures of the bomb damage — rather than by asking whether there is any coherent purpose or justification for bombing. The ultimate triumph of photo opportunities…. What a travesty and national disgrace for this country. April 17 My bottom line on the Kosovo conflict: I hate holy wars. And this is a holy war for American good deeds – or for America’s saintly self-image? Sen. John McCain said the war is necessary to “uphold American values.” Make me barf! Just another … Hitler-of-the-month attack..
May 13 This damn Serbian war… is a symbol of all that is wrong with the righteous approach to the world… and to problems within this nation. Reposted below are a Washington Times piece on post-war body harvesting and a couple Future of Freedom Foundation pieces on Clinton’s lies. Former President Bill Clinton continues to be feted around the world as a progressive champion of human rights. However, a European Union task force last week confirmed that the ruthless cabal he empowered by bombing Serbia in 1999 has committed atrocities that include murdering individuals to extract and sell their kidneys, livers and other body parts. A special war-crimes tribunal is planned for next year. 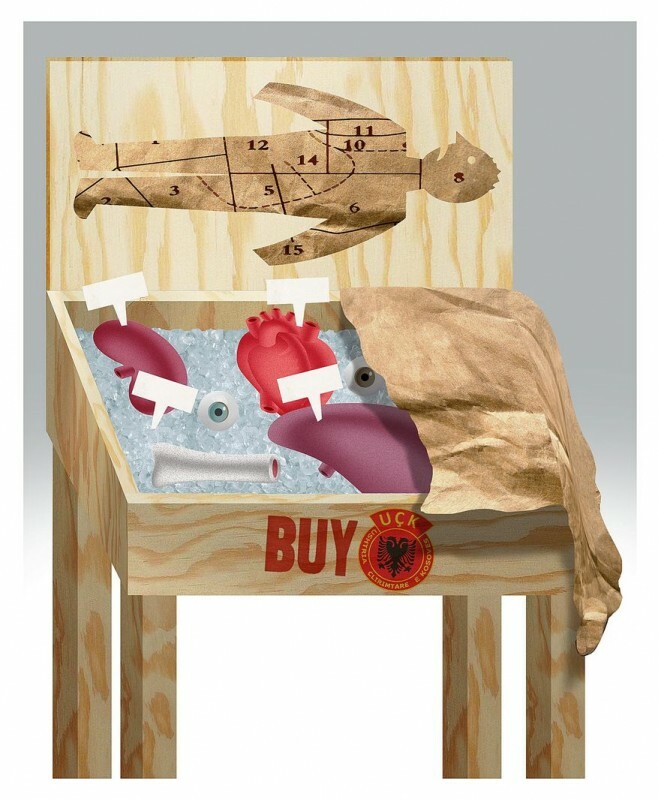 The New York Times reported that the trials may be stymied by cover-ups and stonewalling: “Past investigations of reports of organ trafficking in Kosovo have been undermined by witnesses’ fears of testifying in a small country where clan ties run deep and former members of the KLA are still feted as heroes. Former leaders of the KLA occupy high posts in the government.” American politicians have almost entirely ignored the growing scandal. Vice President Joe Biden hailed former KLA leader and Kosovo Prime Minister Hashim Thaci in 2010 as “the George Washington of Kosovo.” A few months later, a Council of Europe investigative report tagged Mr. Thaci as an accomplice to the body-trafficking operation. The latest allegations might cause some Americans to rethink their approval of the 78-day bombing campaign against Serbia killed up to 1,500 civilians. In early June 1999, The Washington Post reported that “some presidential aides and friends are describing [bombing] Kosovo in Churchillian tones, as Clinton’s ‘finest hour.’” Clinton administration officials justified killing civilians because the Serbs were allegedly committing genocide in Kosovo. After the bombing ended, no evidence of genocide was found, but Mr. Clinton and Britain’s Tony Blair continued boasting as if their war stopped a new Hitler in his tracks. After the bombing ended, Mr. Clinton assured the Serbian people that the United States and NATO agreed to be peacekeepers only “with the understanding that they would protect Serbs as well as ethnic Albanians and that they would leave when peace took hold.” In the subsequent months and years, American and NATO forces stood by as the KLA resumed its ethnic cleansing, slaughtering Serb civilians, bombing Serbian churches and oppressing any non-Muslims. Almost a quarter-million Serbs, Gypsies, Jews, and other minorities fled Kosovo after Mr. Clinton promised to protect them. By 2003, almost 70 percent of the Serbs living in Kosovo in 1999 had fled, and Kosovo was 95 percent ethnic Albanian. Shortly after the end of the 1999 bombing campaign, Mr. Clinton enunciated what his aides labeled the Clinton doctrine: “Whether within or beyond the borders of a country, if the world community has the power to stop it, we ought to stop genocide and ethnic cleansing.” In reality, the Clinton doctrine was that presidents are entitled to commence bombing regardless of whether their accusations against foreigners are true. As long as the U.S. government promises great benefits from bombing abroad, presidents can usually attack whom they please. Mr. Clinton’s war on Serbia was a Pandora’s box from which the world still suffers. Because politicians and most of the media portrayed the war against Serbia as a moral triumph, it was easier for the Bush administration to justify attacking Iraq and for the Obama administration to bomb Libya. Both interventions sowed chaos that continues to curse the purported beneficiaries. Unfortunately, Bill Clinton will never be held liable for killing innocent Serbs or for helping body-snatchers take over a nation the size of Connecticut. Mr. Clinton is reportedly being paid up to $500,000 for each speech he gives nowadays. Perhaps some of the well-heeled attendees could brandish artificial arms and legs in the air to showcase Mr. Clinton’s actual legacy. AS AMERICANS DEBATE what President Clinton’s legacy should be, too little attention is given to his remarks on Kosovo. The United States launched a war against a European nation largely at Clinton’s behest. Clinton’s war against Serbia epitomized his moralism, his arrogance, his refusal to respect law, and his fixation on proving his virtue by using deadly force, regardless of how many innocent people died in the process. Clinton claimed on March 24, 1999, that one purpose of bombing Serbia (including Kosovo) was “to deter an even bloodier offensive against innocent civilians in Kosovo and, if necessary, to seriously damage the Serbian military’s capacity to harm the people of Kosovo.” The CIA had warned the Clinton administration that if bombing was initiated, the Serbian army would greatly accelerate its efforts to expel ethnic Albanians. The White House disregarded this warning and feigned surprise when mass expulsions began. Yet NATO Supreme Commander Gen. Wesley Clark said on March 26 that the upsurge in crackdowns on ethnic Albanians was “entirely predictable.” Since NATO had no ground forces in the area ready to intervene and since NATO planes stayed three miles above the ground to minimize pilot casualties, NATO could do nothing to stop the surge in ethnic cleansing. Violence spurred by the bombing was quickly invoked as the ultimate justification for the bombing. The longer the bombing went on, the more brazenly NATO ignored the limits it had initially imposed on its targets in order to limit civilian casualties. In the final weeks of the 78-day war, all that mattered was finding new targets so that NATO spokesmen could continue their daily bragging about a “record number of sorties flown” and “record number of bombs dropped.” According to Human Rights Watch, at least 500 civilians were killed by NATO bombing; the Yugoslavian government claimed that 2,000 civilians were killed. NATO repeatedly dropped cluster bombs into marketplaces, hospitals, and other civilian areas. However, experts who compared the final surrender agreement with the Rambouillet text were surprised to see that NATO had dropped many of its most onerous demands from three months earlier. In a June 11 speech at an Air Force base, Clinton bragged: “Day after day, with remarkable precision, our forces pounded every element of Mr. Milosevic’s military machine, from tanks to fuel supply, to anti-aircraft weapons, to the military and political support.” Throughout the bombing campaign, NATO and Pentagon spokesmen gushed about the slaughter NATO was inflicting on the Serbian military. However, once the bombing stopped, the Clinton administration was stunned to see the Serbian army withdraw in fine order with polished buttons and good morale. A confidential postwar U.S. military investigation concluded that the damage claims had been exaggerated nearly tenfold. In reality, only 14 tanks, 18 armored personnel carriers, and 20 artillery pieces were taken out, despite the claimed dropping of more than 20,000 bombs on the Serbian military. On the other hand, NATO did have a very high “kill-rate” for the cardboard decoy tanks that the Serbs erected all over Kosovo. At the end of the war, the Serbian military largely was unscathed, but the country’s civilian infrastructure was in ruins. NATO bombs were far more effective against women, children, hospitals, and retirement homes than against soldiers. Clinton also declared in November 1999 that the Kosovar children “love the United States … because we gave them their freedom back.” Perhaps Clinton saw freedom as nothing more than being tyrannized by people of the same ethnicity. Once the bombing started, NATO transformed former terrorists into “freedom fighters” — a term explicitly used in the June 1999 agreement between the NATO and the KLA. As the Serbs were driven out of Kosovo, Kosovar Albanians became increasingly oppressed by the KLA, which ignored its commitment to disarm. Clinton’s standard of virtue seemed to consist of little more than ethnic bean counting: the greater the number of ethnic groups, the greater the virtue. He talked as if every bomb dropped was a triumph for multiculturalism and diversity. He was far more concerned with counting the number of ethnic groups at dinner than in noticing the ongoing purge of the Serbs. Since the United States promised to bring peace to Kosovo, Clinton bears some responsibility for every burnt church, every murdered Serbian grandmother, every new refugee column streaming north out of Kosovo. Despite these problems, Clinton bragged at a December 8, 1999, press conference that he was “very, very proud” of what the United States had done in Kosovo. The “Clinton doctrine,” if strictly followed, would mire the United States in scores of conflicts around the world. 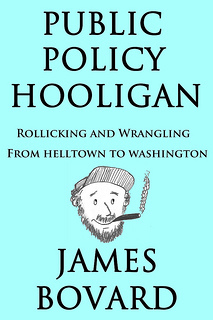 But even though there is little danger that Clinton would actually risk following his own doctrine, his all-caring rhetoric generated positive press. As the world looks on at the growing mess in post-war Iraq, it is time to recall the U.S. government’s bombing campaign against Serbia. There are many similarities to the recent campaign in Iraq. President Bill Clinton’s war against Serbia epitomized his moralism, his arrogance, his refusal to respect law, and his fixation on proving his virtue by using deadly force, regardless of how many innocent people died in the process. Ethnic conflicts exploded throughout the former Yugoslavia in the early 1990s. The casualty toll was highest in Bosnia. In 1995, the Clinton administration backed a sweep by the U.S.-trained Croatian army to recapture Serb-held territory in Croatia. More than a quarter million Serbian civilians were turned into refugees by this attack; much of Croatia was ethnically cleansed in the process, as journalist Doug Bandow reported at the time. The U.S. government made no protest and refused to recognize the plight of Serbian refugees. By 1998, full-scale civil war was raging in Kosovo, a province of Serbia the size of Connecticut. The Kosovo Liberation Army (KLA) controlled about 40 percent of the territory of the province. Both sides used brutal tactics. For instance, at the State Department daily press briefing for March 4, 1998, department spokesman James Rubin announced that the U.S. government “called on the leaders of the Kosovar-Albanians to condemn terrorist action by the so-called Kosovo Liberation Army.” The KLA was known to be heavily involved in drug trafficking and had close ties to Osama bin Laden, allegedly the worst terrorist mastermind in the world. A cease-fire was negotiated between the Serbian government and the KLA in late 1998, but it did not stop the fighting. According to former Secretary of State Henry Kissinger, 80 percent of the cease-fire violations in the months before the NATO bombing campaign began were committed by the KLA. Anyone scrutinizing the Rambouillet document is left in little doubt that the excuses given for the subsequent bombing were fabricated. The peace negotiations were stage-managed, and the Serbs were told: Surrender and be occupied, or don’t surrender and be destroyed. The impossible terms, published in full in Le Monde Diplomatique, but not in Britain, show that NATO’s aim was the occupation not only of Kosovo, but effectively of all of Yugoslavia. The implication that World War II started in the Balkans would surprise Poles who recalled the Nazi invasion of September 1, 1939. April 5 — An attack on a residential area in the mining town of Aleksinac kills 17 people. April 12 — NATO missiles striking a railroad bridge near the Serbian town of Grdelica hit a passenger train, killing 14. April 14 — 75 ethnic Albanian refugees die in an attack on a convoy near Djakovica. April 27 — A missile strike in the Serbian town of Surdulica kills at least 20 civilians. May 1 — A missile hits a bus crossing a bridge north of Pristina, killing 47. May 7 — A cluster bomb attack damages a marketplace and the grounds of a hospital in Nis, killing at least 15. May 8 — Fighter pilots using outdated maps attack the Chinese embassy in Belgrade, killing 3 journalists and injuring 20 other people. May 13 — 87 ethnic Albanian refugees are killed and more than 100 injured in a late-night NATO bombing of a Kosovo village, Korisa. May 20 — At least 3 people are killed when NATO missiles hit a hospital in Belgrade. May 21 — NATO bombs a Kosovo jail, killing at least 19 people and injuring scores. May 31 — NATO missiles slam into a bridge crowded with market-goers and cars in central Serbia, killing at least 9 people and wounding 28. NATO spokesmen responded to each new fiasco by bragging even louder about how smart the bombs were that they were dropping — like defending some mass murderer by talking about his high SAT scores. If Serbian terrorists had blown up hospitals, bridges, neighborhoods, and old folks’ homes in the United States at the same rate that NATO hit such targets in Serbia, Americans would have viewed the war differently. NATO repeatedly dropped cluster bombs into marketplaces, hospitals, and other civilian areas. Cluster bombs are anti-personnel devices designed to be scattered across enemy troop formations. NATO dropped more than 1,300 cluster bombs on Serbia and Kosovo and each bomb contained 208 separate bomblets that floated to earth by parachute. Bomb experts estimated that more than 10,000 unexploded bomblets were scattered around the landscape when the bombing ended. The video was endlessly replayed on Western television stations, driving home the point that, with the speed of modern missiles, there was sometimes nothing pilots could do to avoid catastrophe. However, in January 2000, the Frankfurter Rundschau revealed that the video was shown at the NATO press conference at triple the actual speed, thus making the attack on civilians look far more inevitable than it actually was. NATO officials had become aware of the deceptive nature of the video several months earlier but saw “no reason” to publicly admit the error, according to a U.S. Air Force spokesman. On April 14, 1999, NATO bombs repeatedly hit a column of ethnic Albanian refugees a few miles from the Albanian border, killing 75 people. NATO spokesmen initially claimed that Serbian planes carried out the attack and used the incident to further inflame anti-Serbian opinion. Five days later, NATO spokesmen admitted that the deaths had been caused by NATO forces. NATO then released the audio tape from the debriefing of a pilot identified as involved in the attack. However, this gambit backfired when high-ranking military officers protested that NATO, at General Clark’s urging, had released the tape of a pilot who had nothing to do with bombing the refugee column. The pilot’s words were a red herring to distract attention from the carnage inflicted on the refugees. Unfortunately, few Americans paid close enough attention to the Kosovo war to recognize the danger of permitting the U.S. government to go crusading with bombs dropped from 15,000 feet. President George W. Bush used similar rhetoric to justify the war against Iraq. Since the U.S. government has proclaimed victory over Saddam, Bush is talking as if no one has a right to criticize any misstatements that helped pave the way to war. As White House senior advisor Karl Rove told Washington Post editor Bob Woodward last year regarding the war on terrorism, Everything will be measured by results. The victor is always right. History ascribes to the victor qualities that may or may not actually have been there. And similarly to the defeated. At some point, “history” is going to catch up with the U.S. government. The Bill Clinton statue short circuits my brain and I am unable to think. It is the stuff of Twilight Zone. I heard the statue allows him to boost his speaking fees by 15-20%. Glad I finally found a decent copyright-free picture of that durn statue. Agreed, and too bad there aren’t any Social Justice Warriors there to tear that travesty down.